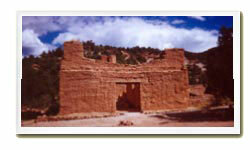 The Jemez Pueblo was originally established in about 1200. The dwellings there were two story structures. 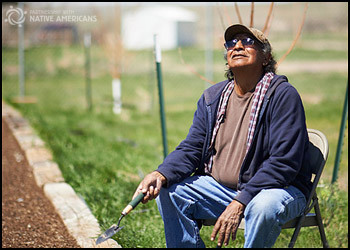 The community totaled about 100 Jemez Indians. They were primarily hunters and gatherers due to the mountainous terrain. During the summer months, they would travel down to meadows to tend fields of corn, beans, and squash. The Jemez were known to be traders in this region. The community had two large kivas. The rooms at this site are larger than most other pueblo sites of this period. By 1540 the tribe was one of the largest and most powerful of the Pueblo cultures. The Spanish entered the area in 1540 and built a very large mission that housed two friars instead of one. The Jemez and the Spanish lived in peace for 40 years. The Spanish left this area in 1689 during the Pueblo Revolts. These revolts were caused primarily by forcibly Christianity on the New Mexico Indians. In addition, the Spanish enslaved the Jemez Indians, took away tribal traditions and meted out harsh punishment. The Spanish reconquered the Jemez in 1696 and moved the Jemez to the community of Walatowa where they currently live. 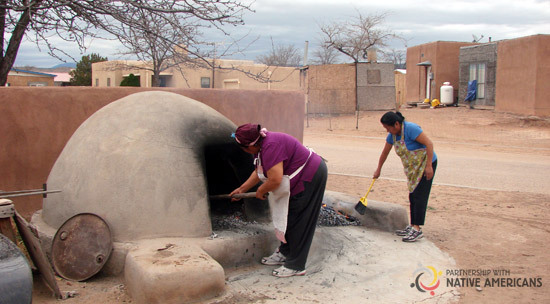 The Jemez Pueblo currently has nearly 1,800 inhabitants and a tribal enrollment of 2,600. Farming is an important part of today's community life. Corn and chilies are the primary crops. The timber industry supplies some jobs in the community. The reservation is also well respected for its arts and crafts. The Tewo-speaking Jemez Pueblo is quite traditional. The community still holds many dances and ceremonies throughout the year. The community has a beautifully preserved town square. Many large homes can only be entered from the roof just as it was for their ancestors 500 years before. The homes here are darker and redder than other pueblos due to the surrounding coloration of the beautiful landscape here.